This article was originally written for and posted on mindbodygreen. You’re ready for love. You’ve got the dating profile and the first date outfit you feel unstoppable in. You’re confident, open, and excited to meet someone new. Yet the type of relationship you desire most eludes you. As a professional declutterer, I’ve worked with dozens of clients who say they are looking for love but whose spaces not only do not attract love but often repel potential partners. While your body language may be shouting "Yes!" to romance, chances are your home is yelling "No!" The good news? In just one day, you can shift the energy, layout, and appearance of your home to be optimized for love. 1. Make emotional space for this person. We had a client whose walls were full of framed photos of her and her family, her and her friends, and her and *gasp* her ex (see No. 5). While she said that she wanted a partner, everything about her space implied that opposite: Her full walls signified a life without room for someone new. Not only that, having her walls so full of memories energetically pulled her into the past. This is not to say you shouldn’t decorate your home as you prefer, but do make sure that there is room both physically and energetically for someone new to enter your life. Negative space is not an absence; it’s allowing space for things to unfold. Try this: Designate space in your home to leave open. This could be a dresser drawer, a couple of open picture frames, a hook next to the door for someone else’s jacket, a towel bar in the bathroom, or, ideally, all of the above. This signals to the universe and subconsciously to people who enter your space that you are ready for love. 2. Shift your layout to support love. I can’t tell you how many clients we’ve worked with who say that finding love is a top priority, and yet their spaces are completely uninviting or unsupportive of a relationship. There might be only one comfy reading spot, just one good coffee mug, or a bed too small to comfortably sleep two people. The point is not to make some voodoo doll of exactly the person you’re calling in but to make your space, however subconsciously, feel welcoming to the person you choose to invite in. In terms of design, this means making room for another person to be comfortable and relaxed in your bedroom with you. Try this: Make your bedroom work for two. 3. Remove stuff from under your bed. This problem seems to be a holdover from college days of tiny dorm rooms shared with strangers. Yet we see so many clients in their 20s, 30s, and 40s with boxes and bins under the bed! This space becomes a musty catchall for things that aren’t needed right now or aren’t a priority. Which is really bad feng shui. You’re literally spending the time you’re supposed to be relaxing and restoring floating just a few inches above dust bunnies and a bunch of to-do's. Ideally, under the bed will be totally empty, no exceptions, which allows for optimal energy circulation around the bed. If you are in a tiny studio or sharing an apartment in Brooklyn where your bed takes up about 60 percent of your room, it might be almost impossible to avoid storing things there. Try this: Keep under your bed completely clear. 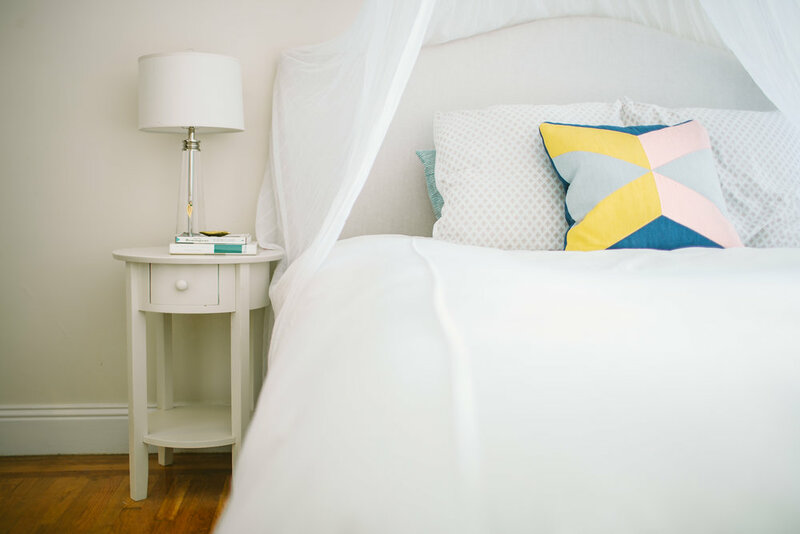 If you must store items under the bed, then do so in this order: clean bed linens, clean towels, clean out-of-season but beloved clothing. Storage should be well-made, closed bins that fit easily under the bed (i.e., if you have to pull everything out in order to find what you want or if the bins are forced up against the bottom of the bed frame, it’s no good). Do not store at any cost: mail, power cords, to-do’s, anything unkempt. Be certain to regularly clean under the bed and declutter any noncrucial items. 4. Get electronics out of the bedroom. This is a good lifelong practice for everyone: single, partnered, child, adult. Bedrooms are the most aptly and literally named spaces in our homes. Bed. Room. They are meant exclusively for rest, rejuvenation, and intimacy. Electronics, on the other hand, are stimulating: They scatter our energy, steal our focus, and distract us from the pure. Ideally, the only items needing electricity in your room would be lamps and possibly an alarm clock or music source. Try this: Remove ALL TVs, computers, gaming systems, cellphones, and other stimulating electronics from the bedroom. Make sure that any remaining electronics are in good shape, dust-free, that their cords are comfortably tucked away, and that there are no overloaded power outlets. 5. Release objects from exes. Objects have energy; that’s why we can have such strong feelings about them. Items from our exes have a powerful vibration that is both negative and pulls us toward the past. Think about stumbling upon an object from a past relationship. Paying close attention, what emotions arise when you see, hold, or wear this item? The best-case scenario is that you feel nostalgia, melancholy, or the distant ache of a fond memory. The worst-case scenario is you spiral into regret, anger, recrimination, loneliness, or heartache. The most effective way to shift your energy—conscious and subconscious—to a positive, present state is to part with the negative items in your space. Try this: Do a "cord-cutting visualization" alongside a thorough purge of items you associate with your ex-lovers. The visualization will help to defuse much of the energetic power of these items, making it far more straightforward to bless and release things from your exes. This includes: belongings of your ex, gifts from them, and items you associate strongly with a memory or experience with them (e.g., the dress you wore on your first date, the tchotchke you purchased on a trip together). If there are things you truly do not want to part with, be conscious of clearing the energy associated with them and how you store or display them. Note: Past relationships that end well still require a type of energetic cutting to allow you to move forward. If you’ve had a relationship where you were hurt, betrayed, or brokenhearted, then all the more so.